As with all of Elizabeth Kolbert's writing, it is beautifully written, compelling, meticulously researched, well structured, and absolutely terrifying. The Sixth Extinction (which is happening now--you can be forgiven for not knowing that, since it is so abysmally reported on) is the tale of the many and varied ways humans are causing this latest mass extinction event. They're all here: prehistorical and modern-day overhunting; transmission of invasive species; habitat fragmentation; climate change; ocean acidification. In keeping with the evidence, though very much against the preferences of human psychology, the book ends on a despairing note. While humans do expend a great deal of energy in identifying and saving particular endangered species when they are particularly beautiful or otherwise beloved, that is in no way up to the scale of what's required, and it is very difficult to see how this could be turned around in time. 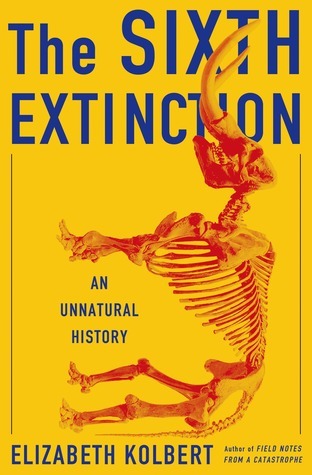 I wish everyone would read this, or at least become more informed about it; not because there's anything we can do by becoming more informed (there almost certainly isn't: within the next hundred years many, and likely most, species will simply cease to exist). But because an event of this significance and caused by us deserves to be marked and mourned while it is happening. A biotic Holocaust is underway all around us, every day, species and families of species being shoved into gas ovens as fast as we can manage it; and outside, we celebrate sporting victories and royal babies and new gizmos to buy. I can think of no more severe condemnation of human nature. Sign into Goodreads to see if any of your friends have read The Sixth Extinction. 0.6% "Testing the efficacy of this year's Sewing Hibernation. Expect random depressing updates on progress of current mass extinction event." 19.94% "Yep. Humans not really coming off so well." 54.17% "Now, see, *this* is horror.\n \n Area X would be (correctly) seen as paradise next to this real-world account."